As a college student, it’s pretty funny how often food is on my mind. Where is my next meal coming from? Do I have time to shop and prepare? How long do leftovers last for? For my entire life, I’ve taken well-made food and cuisine for granted. It was just something my parents put in front of me. Recently, I’ve realized this: there are few things better than a good meal and spending time in the kitchen. Meals are a hearty and happy and robust demonstration of human life. We cook, we share, we enjoy. We finish. Food is fleeting, but also very important. Why can’t I study food in school? Why is it not institutionalized in the same way? I can’t earn a B.F.A. in the culinary arts like I would in painting or design. Yet, in many ways, the theory and science of food is on par and perhaps more complex. The deep experience of any art is ultimately subjective, but in the realm where art is capitalized on, there exist metrics by which we judge and develop taste. In this time when value is often measured by market price, the art of food is valued by dish quality and context. Prices are dominantly based on their ingredients and the atmosphere of the restaurant. Comparable to high art and films, design and craft go into how we create and deliver cuisine. So: why is cooking not considered as fine an art as painting? Taste is an exploited sense for sure, but it goes without the same objective appreciation as oil on canvas. In its discussion, food is afforded less historical context. We wonder less about where recipes originated and the people that brought them to our mouths. Nonetheless, food is iterative and entirely historical: ingredients in a recipe are a cultural document—who decided to put something in a dish, and why? Like with visual art, we have the capacity to learn so much about the stories behind the tastes. Yet, we don’t. At least not enough. As a Chinese-American, sesame oil cures my homesickness. Chinese food, as I’ve discovered in college, seems to be the elixir for all my ails. My tastebud memories of being six and having rice noodles for breakfast on a cold, Seattle Saturday heal me. 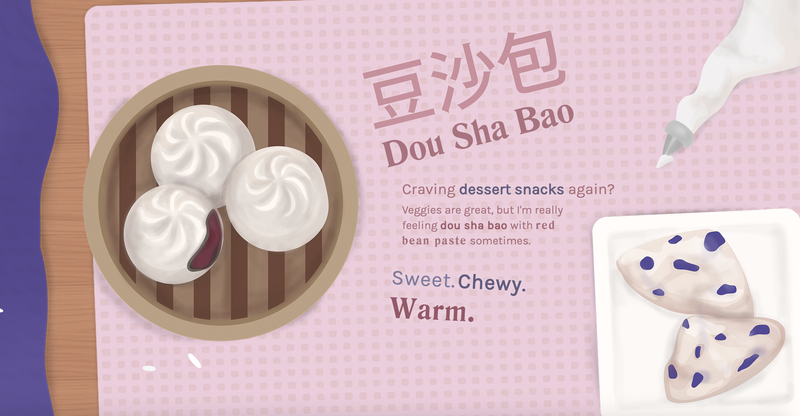 I eat my history in the form of red bean paste desserts and wontons. I’ve realized, though, that you might eat my history, too. Chinese food is great, but I want you to enjoy it with the experiences I get to. Eat it how it’s meant to be eaten. I want you to know why it is important to me. 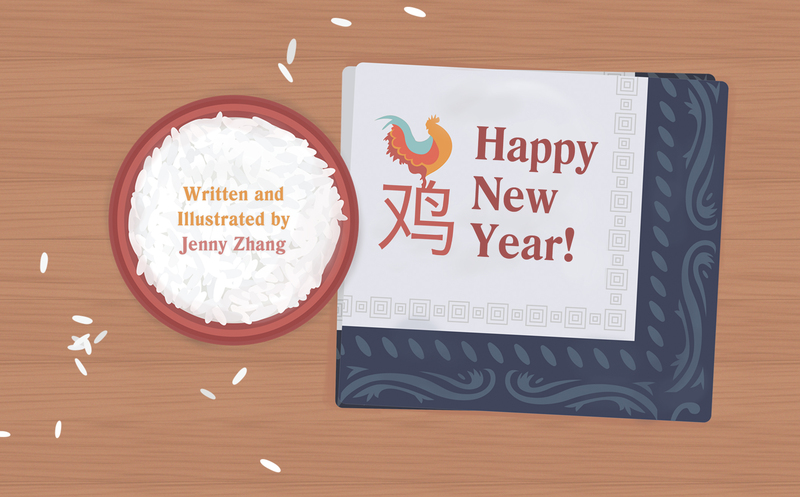 “This Side of Rice” is a short illustration website I created to share with you why Chinese food is important to me. I illustrated some of my favorite foods that I grew up with and captioned it with some memories. The website is a single page and scrolls horizontally. 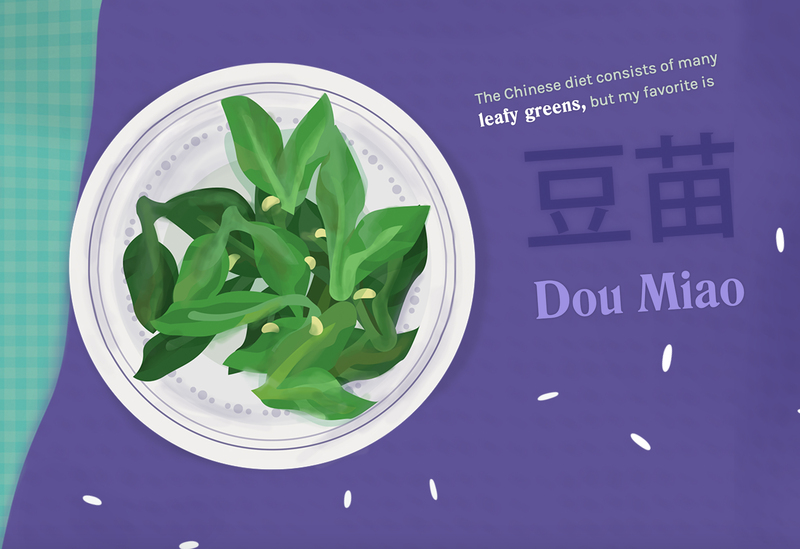 The illustrations are of Chinese dishes next to what are traditionally considered more normalized, “American” dishes on a long, scrolling table. Click on the pictures to go the full website. 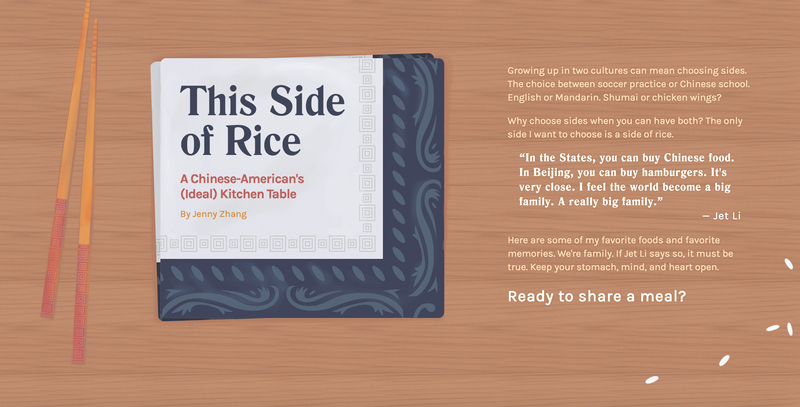 It’s my ideal kitchen table—many Chinese-Americans like me eat Chinese food everyday. If I’m American, why shouldn’t it be considered American, too? Through this exploration, I’ve come to the conclusion that food needs to be a more celebratory experience. At least once in a while, let’s parse our meals and give its history and recipes our attention. To pay respect to the craft and culture of a dish is to dine correctly. And perhaps this will make a fleeting art taste even more delicious. Hi Jenny. Beautiful little site. I found it through One Page Love while I was trying to find inspiration for my own website. And I wanted to see if you’d be interested helping me create it? Of course happy to pay for your services. Do you have an email I can contact you on? PS. Loved the postcards from LA as well.